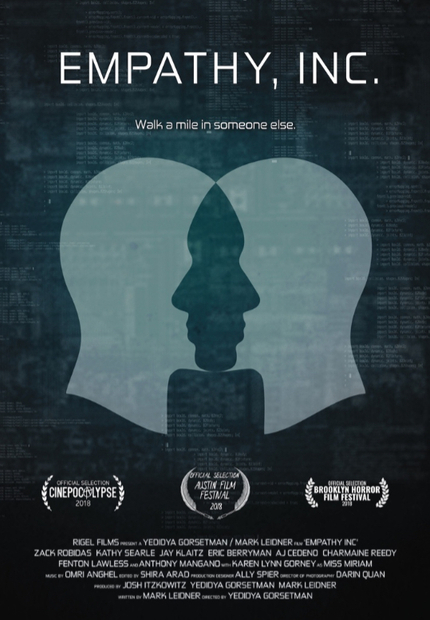 Yedidya Gorsetman and Mark Leidner's nifty sci-fi thriller Empathy Inc. is screening at the Brooklyn Horror Film Festival this weekend. By sheer coincidence Screen Anarchy also has an exclusive clip to share with you from that very film today. Have a look below. The clip takes place very eary on in the story. Joel has bumped into an old friend Nicolaus back in the old home town and they have grabbed a drink somewhere to catch up. Hotshot venture capitalist Joel has a multi-million dollar deal go up in smoke, and he and his actress wife Jessica are forced to move in with her parents and start from scratch. At the lowest and most desperate moment in his life, Joel meets old friend Nicolaus and his business partner Lester, who are seeking investors in a new technology known as XVR—Xtreme Virtual Reality—from their company Empathy, Inc., which is said to offer the most realistic and moving experiences for users by placing them in the lives of the less fortunate. Joel gets the startup its funds, but soon discovers that the tech's creators have far more sinister uses in store for their creation - and that the reality it provides its customers isn't virtual. Empathy, Inc. stars Zack Robidas, Kathy Searle, Jay Klaitz, Eric Berryman, AJ Cedeño, Charmaine Reedy, Fenton Lawless, and Anthony Mangano. It is written by Mark Leidner and directed by Yedidya Gorsetman.